Am I a crocodile or am I a skink?... my name is "Bandit"
I am the l------t s--------r in the world... what am I? We take more time with the disabled so they can really connect with our animals. A B-day surprise along with many more. Our scorpions still have their stingers; we do not alter any of our animals for show purposes. Learn where this native U.S. lizard comes from and learn some interesting lizard facts. Echoing Hills show- we take extra time with disabled and mentally challenged people either at their facility or at their home year round. Thanks to Akron libraries for having us back again for multiple shows in 2014... E and J's animals can come to your library or school too ! Thanks Lubrizol Company for having us back for the Christmas family Show... even the Grinch likes SNAKES! Can you guess what kind of snake this is? Just one of a wide variety that can be at your event. Church event- see "Bellle" boa; just one of five species of Boa that we can bring to your event. Town & Country RV Show; very nice to see our name up in lights...sort of ! We thank the Garrettsville Summerfest crew for having us out. Small tortoises or big tortoises; we got 'em for your event. Red next to yellow can kill a fellow, red next to black is friend of Jack. We wish everyone knew this saying because they would know if the snake was venomous or non-venomous. We have many, many species of snakes to bring to your party or event. Goddard school animal show for the kids. We go to many pre-schools, elementary and middle schools throughout the year. Whoa! That is one weird looking tortoise ! My brother Rusty with his Grandson Tristan holding "Burnese"
My sister Laura helping us out at the Cuyahoga County Fair. Great idea for kids at a corporate event! This is our second year asking Ed and Jeanie to return to our holiday event here at Lubrizol in Brecksville. The show received positive feedback the first year, we didn't think twice when asking them to return. Ed and Jeanie are very nice people who have some cool reptiles to show. Both kids and adults seem to really enjoy this. Thanks again! E and J reptile show came to my daughter's 5th birthday party. The kids loved the show! It was fun, silly, but very educational. They took the time to talk about the animals. Not only do they put on the show, but it's obvious that they care very much for the animals and are in this line of work for a greater cause. I highly recommend. First of all, thank you!!!! Your daughter was such a little sweetheart, loved the animals and she gave us a hug to say thank you.... everyone was respectful to the animals and overall a great experience... hope to see you guys in the future. A wonderful time for everyone! Thank you so much to E and J reptile show for making our 7 year olds birthday party so memorable and fun. The animals were great and exciting and all of the kids had a chance to touch and feel them and ask questions, etc. We have to say that Henry was one of the most polite little boys that we've encountered in some time. Not too many times do kids come up to us and really thank us for the show and gifts that they receive.... a very nice bunch of kids and they treated the animals with respect as well.... thank you for having us out to his party. 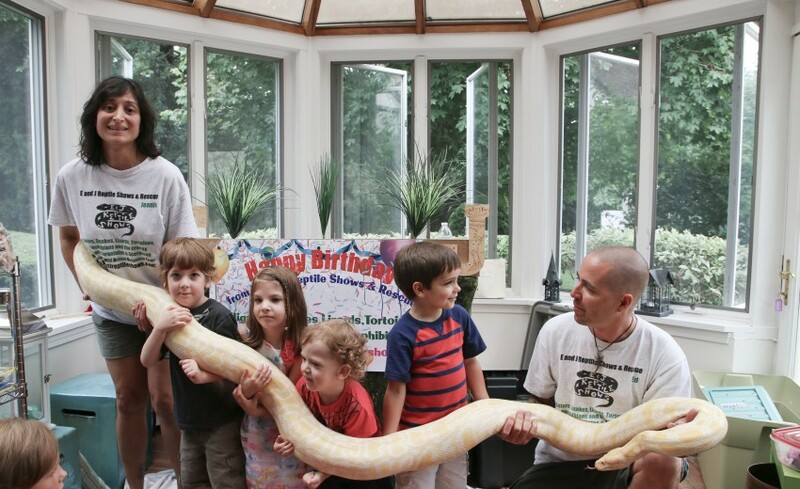 We are very pleased with how our daughter's 7th birthday party turned out with the help of E and J Reptile shows! The children were falling over themselves to see the creatures and join in the fun. Ed was extremely knowledgeable and entertaining and we would (and have) definitely recommend their show to our friends and family. E & J reptile show was amazing! My son was a little hesitant at first and they made him feel so comfortable. After 10 minutes, he was touching all the animals and participating. Thank u so much! You made his birthday unforgettable! These two are really great at what they do! ed and Jeanie were so good with about 20 kids of all ages at my Daughter's seventh birthday party. So happy with this decision to hire them. They are super dun, knowledgeable, and stand for an excellent cause. Even the adults loved this show. They are worth every penny. My daughter loved it and so did our party guests. thanks ed and Jeanie! Don't be surprised if we hire you again for our son since he fell in love with your turtles! I will definitely recommend these two to anyone for anything, corporate, private, or otherwise. Awesome show for birthday party! We had E and J for our boys' 10th birthday party & everyone thoroughly enjoyed it--kids & adults!! Ed & Jeanie told us information & stories about each one of the reptiles which kept everyone interested. Keeping 12 boys' attention isn't easy, but they did it during the whole show. I love that Ed & Jeanie care so much about animals & rescue them. They have big hearts & are very kind. I would definitely have them again!! Thank you Ed, Jeanie & Brandon too. It was OUR pleasure coming out to your two son's birthday party to perform one of our animal shows. Thank you for having us out after you seen us at the Green library show last month.... we hope to see you in the future, take care and be safe! We had E and J Reptile show at the birthday party for our Twin 6 year olds and 3 year old. The age range in attendance was 2-10 and everyone (including the adults!) had a blast. They were professional, entertaining and very knowledgable!! You can tell that they really care for their animals and they shared touching stories about how many of them were rescued. My initial concerns about having wild animals around children were completely unfounded. E and J were completely in control and the animals were very well behaved! A terrific day!! Thank you so much for the kind words and the review. The kids and adults were awesome and someday the twins will probably take our place. They know their reptiles and amphibians for only being 6 years old..... we hope to see you guys in the future. We had E and J's Reptiles come out to our Relay for Life this past weekend and it was Awesome! They were very educational as well as able to keep it fun and have some laughs. They kept the kids attention and it was a good sized group they were in front of! They did an amazing job and I will absolutely be inviting them back next year! I want thank Ed & Jeanie from E & J Reptiles for there awesome work during our Open House. They did a great job of entertaining customers and creating memories for the kids. Our attendence was outstanding and I credit some of that to the terrific show they put together. Thanks again and I would recomend them to anyone looking to differentiate themselves from the competition. Jeanie and I want to also say that you made us feel welcomed and made our visit fun and exciting. One of the best group of kids and adults we've been to in a while. Everyone was polite and very friendly to the animals; also had some great questions. We are glad to hear he loved the animals that we had shown..... thanks for the review ! E & J made my sons birthday an unforgettable one! My son wanted a lizard party for his 12th birthday and I wanted to give him just that. My husband and I decided to find a way to have real lizards to his birthday party and we found E and J. We went with them because they were much more affordable than the other business we contacted. E and J worked with our birthday budget and gave a great show. They were prompt, entertaining and a joy to have at our home. The children loved it and learned a lot (so did we)! My son was so happy with his surprise lizard show and we were happy that we choose E and J. We had a great time at our event with the Reptile Show. Their whole staff was extremely courteous and knowledgeable. The event was a bit chaotic due to the weather, which forced them to set up at two different locations during the event. They had no complaints and just went with the flow which is exactly what we needed. I would definitely recommend them and we plan on using them again in the future. We thank you Sarah for having us out to the Walsh University festival. We had a great time even though the weather was horrible. Thanks for making our visit very special. The kids and adults gave us very nice compliments for the rescues we have done and they loved the animal show we presented.... can't wait to see you in the future. I heard this so many times today from my son’s eight-year-old friends who came to celebrate Gabe’s Birthday. Our thanks to Jeanie and Ed from J+E Reptile Shows & Rescue who graced our party with an interactive, educational, and fun show featuring twelve interesting critters including an alligator, tarantula, scorpion, box turtle, and show-stopping 75 pound albino python. Jeanie and Ed’s knowledge and passion for the animals is contagious and inspirational. We all learned a lot about some really cool animals. I highly recommend them for any party or event - they are sure to please young and old alike. Your party will be ‘the best party ever,’ too! E and J Reptile Show did a fantastic job for my son's 6th birthday party! Very knowledgeable about all of their animals, very patient with excited kids and curious adults as well. Everyone at the party gave us great compliments and feedback and we impressed with Ed, Jeanie and the entire group of reptiles. Ed and Jeanie made my son one super happy kid and I cannot thank them enough! Job well done! A Fantastic and educational show for young and old! I wanted something different for one of my parties and the E and J Reptile Show was over the top! I thought the kids would get a big thrill from petting the reptiles and snakes, but the adults were even more enthusiastic and asked the most questions. The E and J team were very knowledgeable, cordial and answered all the questions. Their set up and presentation was excellent. I highly recommend E and J for an extraordinary party event! E & J performed at our annual mobile camp for individuals with Intellectual and Developmental Disabilities August 13th and 14th 2013. I must say out of all the animal shows that we have booked this one was by far the best. The presenters were very knowledgeable about their animals, answered any and all questions from our individuals, let everyone touch the animals, and they were very personal. Ed was very communicable with the staff of our facility via e-mail, which is a plus as this is a great characteristic of his professionalism. I cannot express how much of a privilege it was to have them perform at our camp. They were a big hit with everyone and we took a lot of pictures to remember the experience. They are reasonably priced and are worth it for the travel, set up and time that they spend performing their show. I would definitely recommend them to others as entertainment for their party or function as they are an awesome group! Great show for both the young and adults! Everyone had a terrific time learning about the reptiles and were able to interact with them as well! Thank you for coming to Green - great job Ed & Jeanie! excellent show! the kids had a blast! E & J put on a wonderful show. Each kid got to see almost every reptile and it was as educational as it was fun. They arrived early and were very professional as well. It was a great experience overall. E & J Reptile Show did a wonderful show for my daughter's 3rd birthday party. They kept the children interested and had a great selection of reptiles that the kids and adults could interact with. They came and set up in a timely manner and were very knowledgable and interested in caring for and teaching about each reptile. Great show- I would recommend them for all ages and events! E and J are experts when it comes to reptiles! 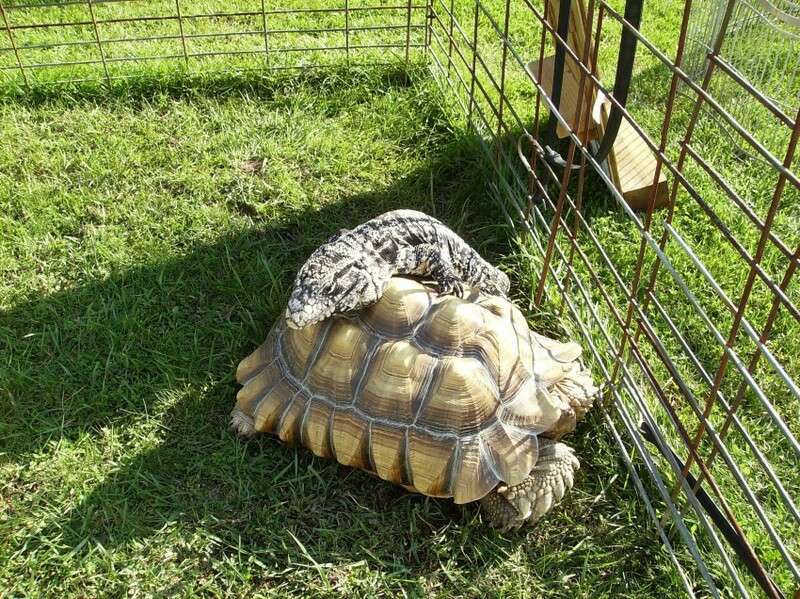 Their show featured rescued reptiles that E and J personally nurtured back to health. They made sure to take all the necessary safety precautions so even young children could participate. The animals were calm and expertly handled. My daughter and her friends had a blast learning and touching the snakes, alligator, tortoise, lizards, and arachnids! It really was amazing, I would recommend them for anyone looking for a fun and informative party idea! 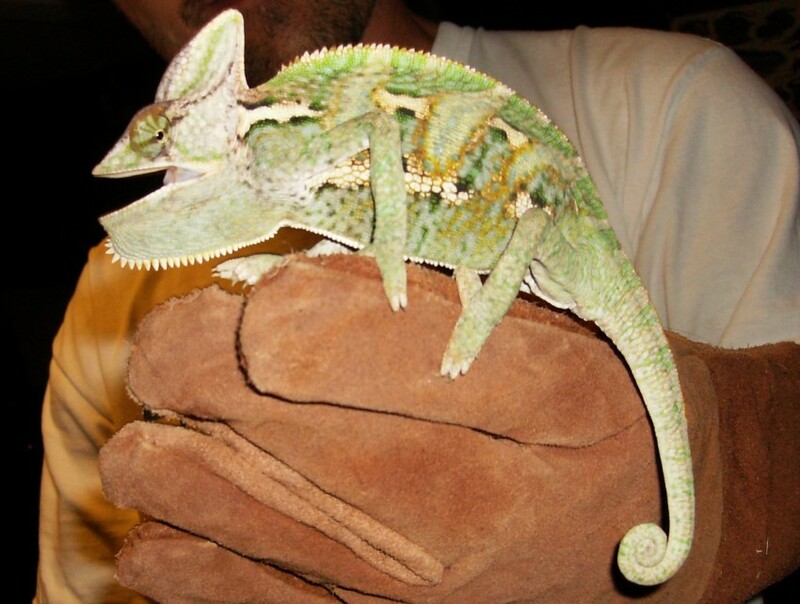 Ed and Jeanie are experienced professionals who are passionate about their reptiles. They handle their animals with love and respect and encourage people to do the same. They take the time to really educate children, as well as adults about the reptiles' fascinating natural history, care, and conservation. They encourage kids to ask questions and interact with the animals. And it is truly exciting to see their awe and wonder of these beautiful, yet often misunderstood creatures. held at nature centers, school events, and parties. I couldn't have been more excited to be apart of their team! with all the essential care they need. Some of these rescues even end up as part of the shows. everyone with a fun and amazing time! I also want to let people know how professional Alexa is with our clients. She is an animal lover just as we are. We knew from the first day she helped us at a nature center, that she was going to be a great animal handler. Not only is she our helper, she has turned out to be one of our best friends. I have never seen a person care so much for animals as she does. She has handled all of our reptiles, amphibians and arachnids over the years as if she has been doing this for years. She impressed us more than most other animal entertainers that we have seen. Whatever she chooses to do for a living, she will succeed at anything she does. She will always be welcomed to help us out with our animal shows. She may also be on the D.W.A.R.T. team with us come July of 2013. D.W.A.R.T. is the "Dangerous Wild Animal Response Team". We will be working along side vets, firemen, police, city, county and state officials from Cleveland and Columbus. E and J Reptile shows is great. E and J Reptile shows was awesome. They were all so nice and their reptiles were so cool. I learned a lot about their reptiles and they made me feel safe with snakes. I loved skating with Tinese. She was so chill and calm. All we can say is how AWESOME Kayla is as a skater and even a better person. Not only did she skate with our smaller albino Burmese python in her routine, she skates like an Olympian. We can tell she almost wasn't going to let us take our snake back home with us... good luck Kayla with whatever you do in life. I was looking for something different for an event i was directing and E and J reptile show was just what i was looking for. Ed was so professional and easy to contact. He got back to me with in hours of emailing him. My guest was so entertained by the show. They brought all kinds of retiles, some that many of my guest had never seen or heard of before. Ed and his wife went above and beyond what was asked of them. I would recommend them to everyone in need of a fun and interesting show. Thank you so much for being a part of our event. You made memories for everyone that came!!! We want to thank Victoria and the Strongsville Skating Club for hiring us to perform our reptile, amphibian and arachnid show for the pre-show entertainment. This was a two for one deal. The first day was quoted, but at a reduced amount. The 2nd day was donated by Jeanie and I in which we actually did two shows within an hour and a half for two crowds of kids and adults. We are supporters of the Special Olympics in which some of the Skating Club's proceeds went to the Special Olympics. We also had a photo session for people to have their picture taken with our American alligator and Burmese python in which those donations also went to the Olympic fund. We went to a fundraiser for Huntington Disease in August 2012. The E and J Reptile show was wonderful. My two twin 7 year old nieces were amazed and thought that it was so cool and neat to be able to see and hold a "huge" snake. They liked the whole experience, and they are still talking about it months later! They have the picture of all of us holding the snake in their room. It is an awesome show and I would recommend them to friends and family for any birthdays and shows at any time. Adults and children both would love it. I know that we did!!!! Thanks Jane for the wonderful words. Jeanie and I love you guys and we will be friends forever. Thank you for helping the HDSA fundraiser and being part of the E & J photoshoot ! GREAT BIRTHDAY SHOW!! That is ALL MY SON TALKS ABOUT! We have had E and J the past 2 birthdays for my son who turned 3 and then 4.. When we asked my son what he wanted for his 4th birthday he said right away he wanted them back! Great Show, Great Education.. All the kids and adults had a GREAT time.. Highly recommend them!! Thanks for the review... we are thrilled that Aaron had a great time for his 4th birthday. We brought a few different species of reptiles and amphibians to each of their shows so they didin't see the same thing twice. We're always adding different animals to our collection so we can bring a variety to repeat clients...."Lucky" the gator says hello to Aaron and his family... thanks and hope to see you again! I hired E and J Reptile for my son's 5th birthday and we were very happy with the show! They were professional and very knowledgeable about the reptiles they have. My son is still talking about how much fun the show was! Highly recommend!! We hired E & J Reptile Shows & Rescue to perform at our son's 7th birthday party at our home, in June of 2012. The experience couldn't have been better! From the scheduling, to the outstanding show, to the set-up/take down...they made it easy. The audience ranged in age from 3 to 70, and EVERYONE was entertained. They kept the attention on our son, and created some great photo opportunities for him and his buddies. Best of all, the owners were knowledgable, informative, and entertaining and really cared for the creatures they presented:). I highly recommend them for outstanding entertainment! My mother and I went to a Fundraiser on August11, 2012 in Twinsburg, Ohio. I wanted to thank Essie and her Mom for asking us to do a family birthday party this year. These people were great at the walk/fundraiser. 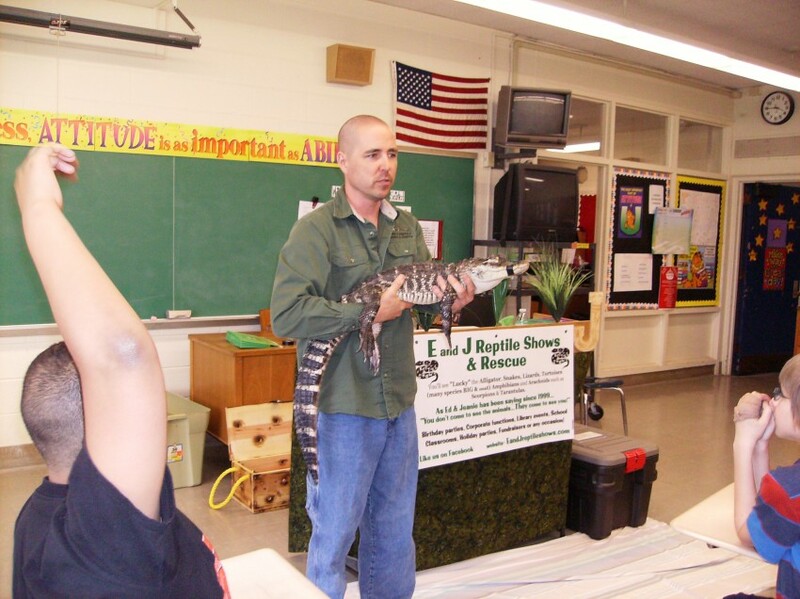 We posted a picture of Essie helping Ed hold our American alligator. We look forward to doing their birthday party animal show this Summer. I highly recommend E&J Reptile Show for any event you are hosting. It was fun, exciting,and very educational. The children was so amazed that they were able to touch and hold the reptiles. Adults were fascinated with the show. EXCELLENT SHOW!!!! Thanks Gloria for asking us to do your Summer party. The kids were great as well as the adults. Anyone who helped Jeanie and I hold some of the reptiles, learned a lot about what it takes to care for some of the animals they asked us about. Thanks again for asking us back out to your holiday party later in the year. We have held camp for 18 years and have many different animal acts. E and J worked well with the children and held the attention of all the campers. Thanks guys for making our camp fun. All of the children were great with the animals..asking questions about the animals that we brought that were from their native country or area. It is a great camp consisting of adopted Latin children that have great leaders and counselors at the camp. E J Reptile show was featured at our summer festival at work. They brought many different species of reptiles to the show. The owners Ed & Jeanie would bring each animal out of the cage and hold them and talk about that particular reptile. They were very professional, and entertaining. The children at the festival were able to hold each reptile, and ask questions about them. Adults & children alike were fascinated with the show! Insurance: $2,000,000 - Residential & Commercial Reptile and Animal Liability. Children and adults should expect a hands-on, safe interactive, educational, fun experience as they see, touch, hold and learn about each animal species that we bring out. Our main goal is for kids and adults to be safe, have fun and learn as many things as possible about the animals we bring to their event..
We can bring "Lazer" the small Caiman, many others such as geckos, exotic medium sized lizards, larger iguanas, tortoises, frogs, salamanders which are the largest land dwelling species, creepy crawlies like tarantulas and scorpions and "Squasher" the BIG yellow Burmese python as we pick three or more volunteers to help us hold her at the end of the presentation. We can customize a show for you to your needs and you can choose the animals we bring or we can choose them to fit age group or theme of event. With the experience we have from rescues, caring for these types of animals and knowing husbandry of every animal in our care and others... this information and education is passed onto our audience. If you have doubts about reptiles now, you will have a different feeling about these animals once our show is over. "E and J Reptile Shows" are incident-free from the time we started doing our animal shows in 1999. We are fully insured and can provide a copy of our certificate if requested. 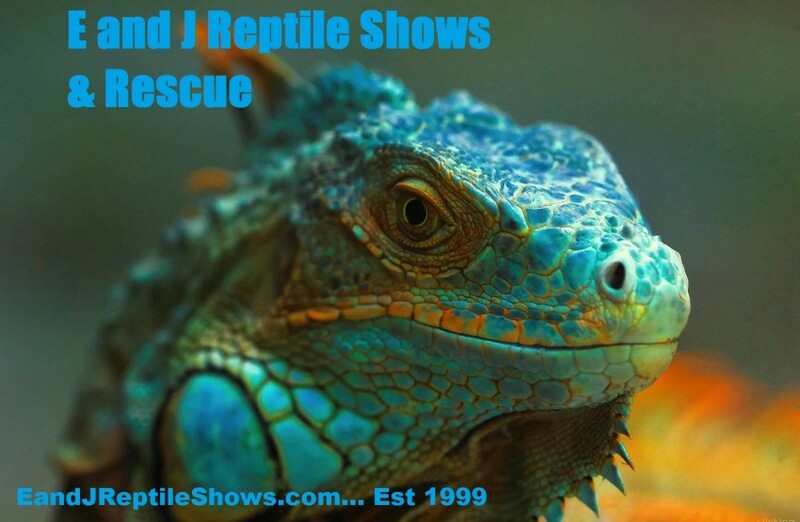 To contact us, visit our website at www.EandJreptileshows.com.... (New Website coming soon, temporary one on line now) or you may call us directly at 216 952 5285 to also schedule a show. We can customize a show for you to fit your budget needs. I promised my Mom who passed away in August of 2013, that I will continue our rescue efforts and perform our shows in her name. Hi, it's Ed and Jeanie....for your event, we bring "up to fifteen animals" that can be pet, touched and some that can even be held. We make sure we have children volunteer to interact with us and our animals. Don't want to give anything away, but many surprises await. It is a funny, educational and exciting presentation that we have been entertaining children and adults of all ages since 1999. If you are looking for animal entertainment, children's petting zoo, children party entertainment, corporate party ideas or any event... give us a try! You have two main packages to choose from on our website or WE CAN CUSTOMIZE A SHOW FOR YOU TO FIT YOUR BUDGET NEEDS. As for what animals we can bring, we have a wide variety of reptiles, amphibians and arachnids that are amazing, fascinating animals and sometimes they are completely misunderstood. If requested, we can bring a young Caiman named " Lazer" which is a Crocodilian. We also have cute little Geckos, Snake species from 6 inches long and a few longer than two average size men. I always hold the head-end of all snakes during presentation, but kids and adults can interact with these due to their docile nature. We have many other exotic & U.S. native Lizards small & large such as Iguanas, Tegus and Monitors; Tortoises from 6 inches and up to over 2 feet and weighs over 50 pounds; her name is Tank... many of them can also be held or touched. Amphibians such as exotic frogs, toads and the largest land dwelling salamander in the world. Arachnids such as tarantulas and scorpions- which our species are harmless to humans. And WE DO NOT CLIP STINGERS OFF- anyone who does that doesn't realize that the scorpion has a good chance of being stressed and will die within months because it doesn't have it's defense mechanism. If you want all snakes at your party, all lizards at your party or what ever combination of animals... we'll make sure you get what you want! We have been doing animal rescue since the mid 1990's and started doing animal shows in 1999 which funds our free rescue efforts. "Lucky" the alligator can no longer be used in our shows by ODA laws and Ohio regulations. American alligators are illegal to be used in Ohio shows. We are permit holders through Cuyahoga Health Dept. and obey regulations pertaining to recommending hand washing with hot water and soap after all shows. They recommend children be 5 and older to be able to touch reptiles and amphibians. One thing we don't have in our collection or in our shows are any water turtles. This is the easiest way to transmit salmonella due to fact turtles swim in the water they poop in. All shows we do are done in a safe manner and every safety precaution is taken and is always first on our agenda.... No worries at all. We bring in our animals in secure containers. With our animals, no worries about fur or hair left behind... allergy-free. We do however lay down a cotton sheet around our folding 4 foot nature display table when indoors. Larger venues, we can bring a speaker and microphone setup for audience to be able to hear. If you can provide setup, let us know. No water turtles in our show or collection, but we still do ask parents or adults to inform children of all ages to wash hands with hot water and soap after show if they touched any animal... this is a recommendation from health department as we are permit holder through the Cuyahoga Health Dept. WE CAN CUSTOMIZE A SHOW FOR YOU TO FIT YOUR BUDGET NEEDS ! We'll give you many options to choose from so we can make sure your party or event will be special and memorable. Start off by letting us know what animals you or your child may want us to bring. If you want all snakes, all lizards, a mixture of snakes, lizards, tortoises and everything else.... we can make it how you want it. You can pay by credit card on our website, send a check or pay by cash. We serve most of the northern half of Ohio including Cuyahoga county, Lake, Geauga, Portage, Summit, Stark, Lorain and Medina counties. Ask if we can travel to your city or county. We can travel further for longer venues or all-day events. Ed influenced by his Mom & Dad, sister and three brothers who all cared for many species of animals from the time Ed was born, started caring for reptiles and many other species at the age of seven which included tarantulas, frogs/toads, alligators, snakes, iguanas and other lizards. Ed has been caring for reptiles for over 40 years now..... the late Steve Irwin and Jack Hanna are also his favorite animal guys. Ed & Jeanie do their shows in his Mom's and Dad's memory and Jeanie's Dad's memory. Jeanie's main influence was her Dad who took in injured hawks and other birds of prey as she was just a little girl. They brought most of the birds and other animals back to health. Either they released them back to the wild or found a sanctuary to take the animals and provide a good home. So.. Ed and Jeanie... a perfect match! Adults/parents required to inform children to wash hands with soap and hot water after any animal show.